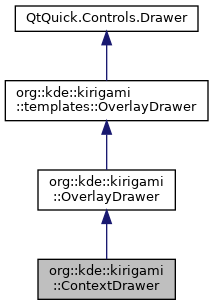 A drawer specialization that will show a list of actions that are specific of the current page shown by the application. Definition at line 67 of file ContextDrawer.qml. actions: list<Action> This can be any type of object that a ListView can accept as model. Definition at line 79 of file ContextDrawer.qml. Definition at line 94 of file ContextDrawer.qml. Definition at line 88 of file ContextDrawer.qml. Definition at line 73 of file ContextDrawer.qml.